Audible After the playcall is given to the unit, a player on the field (typically a Quarterback offensively and a Middle Linebacker defensively) make an adjustment to the playcall on the fly. This may mean that a player runs a different route, blocks someone else or covers a different zone defensively. Peyton Manning famously makes a lot of these calls at the line. All Pro At the end of every season, an Associated Press media members panel pick the best players in each position from that given season. Canton The town in Ohio that homes the Hall of Fame. Players that put in a series of Hall of Fame worthy performances are said to be heading to Canton. Cornerback These defensive backs cover the receivers in the passing game but are also expected to contribute in the running game to bring down the Running Back. Defensive Tackle A Defensive Line position that plays along the inside of the line. These players are usually lined up to challenge the Guards and Centre on the Offensive Line. Draft The main entry point into the NFL for players. Held every year, seven rounds of thirty two picks - one pick per round per team. Guard Either side of the Centre on the offensive line and inside the right and left tackles, Guards are charged with opening up holes in the defensive line for the run game and protecting the Quarterback. Hail Mary a desperation play at the end of a half - typically at the end of the game - where a quarterback hurls the ball high into the air and gives his receivers a shot at a jump ball in the end zone. Named after the Roger Staubach play for the Cowboys against the Vikings in 1975. You can check out a selection of these plays below. Line of Scrimmage The point on the field where the ball is snapped from. Muffed punt/kick When a kick returner touches the ball but fails to possess it. Most commonly, this will look like a dropped catch but also includes accidental touching of a ball that is likely to be grounded. This occurred in the 2013 meeting between the Pats and Broncos. Neutral Zone the space between the Offensive and Defensive Line. This area is the exact length of the football and no player (apart from the Centre who snaps the ball) is permitted to have any part of their body in this area. Any infringement results in a penalty. Pro Bowl An annual exhibition game held the week before the Super Bowl in which players who have been voted the best in their position compete. Unlike All Pros, Pro Bowlers are selected by coaches, players and fans. Although the game is somewhat ridiculed these days, being selected to the Pro Bowl is still considered one of the greatest honours in football. Pulling Performed by the Offensive Lineman, most often by the guards, when they run out of formation in front of the Running Back to block downfield. Quarterback The most valuable position in football. These guys run every snap on their offense (unless the unit is running the wildcat) They take the snap and either hand the ball off to the Running Back or pass to one of their Receivers. They also read out the playcall to their teammates in the huddle and make audibles to them thereafter. Safeties The last line of the defence. They sit behind the corners and Linebackers and pick up the deep running players or any broken coverages. They can also cover players by design in certain play calls. Teams usually play two Safeties at any time a Free Safety and Strong Safety. Strong Safety The Safety that lines up on the strong side of the field. They tend to be bigger, stronger and play closer to the line of scrimmage than their counterpart the Free Safety. 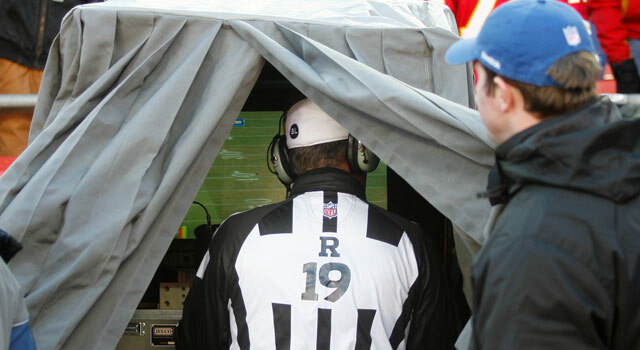 Under the hood A review of the previous play by the officials on a touchline TV. For some apparent reason, the TV is traditionally kept under a large cloak. The result of the reply can be to reverse the call on the field, confirm the ruling on the field or, where no clear evidence can be seen, keep the ruling as originally called. To announce that the play on the field stands traditionally implies that some element of doubt exists, it just can't be substantiated. Wildcat An offensive formation where the ball is not snapped to the Quarterback but to another offensive player, typically a Running Back, but occasionally a Wide Receiver or Tight End. The Chiefs introduced it in the 80s, the Dolphins ran it in the 00s, but it doesn't feature as prominently in the modern game.